Terry and I have been visiting the marvelous Goose and Turrets bed and breakfast in Montara, California pretty much for as long as we’ve been together, which goes back to 1991. I’ve been staying there since 1986, which goes back to my first marriage. That means I’ve been a guest from the first year or two that they’ve been open. The proprietors, Raymond and Emily, generously gave us two free nights there last year in recognition of my being their longest continuous visitor. We always love going there, because, the wireless Internet access notwithstanding, it is a place of quiet, serenity, and calm. It’s a place to de-stress and recharge. It’s also a place to get the best breakfast you can find anywhere. Breakfast is served promptly at nine. You have your choice of coffee or tea, which you specify at check-in. They also serve juice. Breakfast is four courses: fruit, grain, a main dish, and sorbet. How many places can you go where you get dessert for breakfast? Terry and I were there the first week in December to celebrate her birthday. There was one other guest, a beautiful young woman from France named Elena whose family Raymond and Emily know. For breakfast on our second morning Raymond prepared Eggs Benedict as the main dish. Elena said that this was her first Eggs Benedict. It was mine as well. Terry loves Eggs Benedict, but like Sam I Am of the famous Dr. Seuss book, I have always avoided eggs in any form other than scrambled. But being a good B&B guest, I was not about to disrespect Raymond’s efforts. I took a taste. The Hollandaise sauce was perfect, and the dish was superb, even though I have never been big on poached eggs. Like Sam, I came around in the end, and I am glad I did. If you’re looking for a getaway, go visit Emily and Raymond. And tell them that Terry and Mike sent you. I’ve said that Cambria doesn’t change a lot. 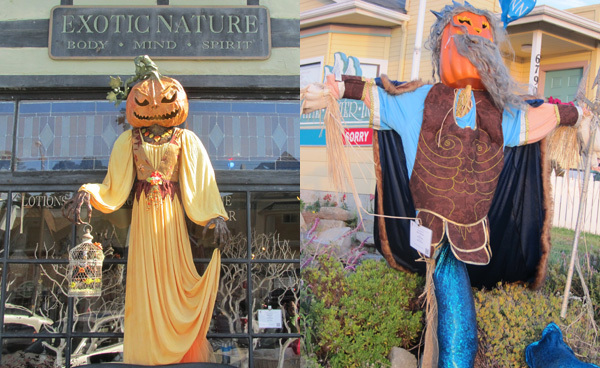 One innovation there, however, is the Cambria Scarecrow Festival each October. It’s a recent occurrence, having started in 2009. Terry and I first discovered it in 2011 when we were in Cambria in October. The festival has expanded greatly in the past two years. 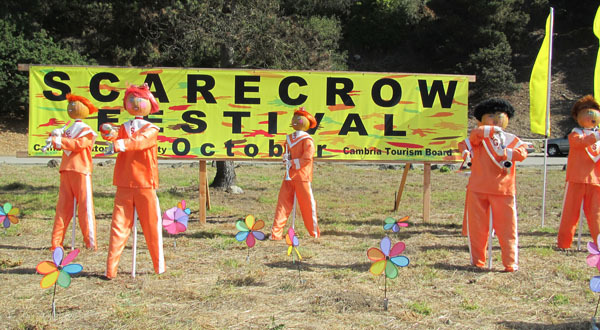 This year there are more scarecrows, and a few have migrated up Highway One to San Simeon. They are more sophisticated. One family of scarecrows is actually in motion, riding bicycles. Many of the faces are more completely drawn, replacing the zombie-esque appearance a lot of them had in 2011. Here is a more-or-less random sampling of 2013 scarecrows, courtesy of Terry. Not sure who the figure in the left represents. Neptune on the right, in front of the White Water Inn. 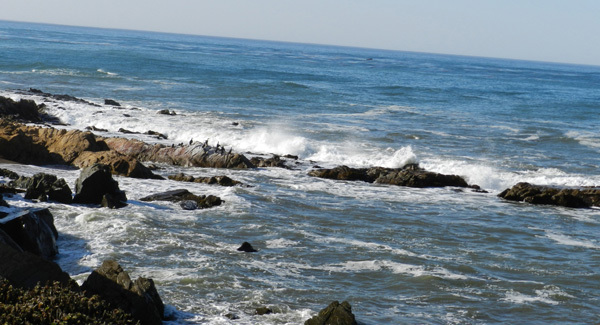 When we stay in Cambria we make a point of eating at the Sea Chest restaurant. I’ve written about it before, but not since I’ve been here at WordPress, I don’t believe. We’ve been dining there for as long as we’ve been staying in Cambria. It has been around forever. It’s in an old building that overlooks the ocean. They don’t take reservations, and they don’t take credit cards, so I always make a point of making an ATM withdrawal just for our Sea Chest dinner. They open at 5:30 p.m. That means you want to be there standing in line by 5:10 p.m. One of the nice things about that is that you often get to have a conversation with the folks ahead of you or behind you in line. Last week we chatted with the couple in front of us. They must have been close to our age and were from Chicago. They were making a West Coast tour to celebrate their engagement. They had been told about the Sea Chest, and knew the rules about getting in line and no credit cards. The doors open promptly at 5:30 and seating is very quick after that. The service is quality, though not necessarily prompt, given so many people being seated all at once. But the view is gorgeous and the food superb. Terry had the Cioppino and I had the Petrale Sole. Rather than traditional tartar sauce, they served a mixture of sour cream (I believe), tarragon, and dill. 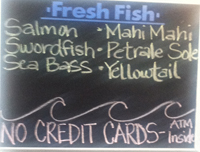 I don’t like tartar sauce, and usually only add lemon to my fish, but this was marvelous. The roasted potatoes are even better with the Cavender’s Greek seasoning, which they have at each table. It’s good that we walk there, so we have the chance to burn off some calories on the way home. The village of Cambria has two parts to it. There’s the East Village and the West Village. 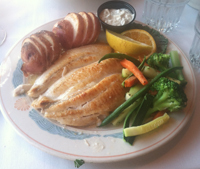 In the West Village you’ll find the long-established Linn’s restaurant, which serves old-fashioned hearty fare. They also have a gift shop just up the street. Across the street from Linn’s is Cambria Wildwood, a clothing store that has quite a variety, including, of course Cambria-themed shirts and T-shirts. Up the street from there is a relative newcomer, the Tea Cozy. It’s British-themed, with plenty of souvenirs in honor of the Royal Family. They have marvelous teas and soups. In fact, they have a much wider menu, but that is what we’ve tried. That’s where we discovered Scottish tea, and it has since become the tea of our Saturday breakfasts. We pick up a box whenever we’re in Cambria. In the West Village you’ll find Madeline’s Restaurant sharing a small building with the Cambria Wine Shop. We’ve never eaten at Madeline’s, but we always stop in at the wine shop to buy a nice bottle of local wine and some cheese and crackers for an evening after we have an early dinner. Also in the West Village there’s the Main Street Grill, which has as good cheeseburgers and fries as you’ll find anywhere. Last week we discovered a charming clock shop at the far end of the West Village which contains an amazing variety of timepieces, where Terry had her watch strap, which had come off, reattached. Of course that’s just scratching the surface. There’s many shops and multiple gourmet restaurants, such as the Sow’s Ear (in the East Village), which has a great reputation, and which we have never tried. We’re creatures of habit, but we do enjoy our habits. Terry and I don’t remember when we first visited Cambria. We agree that it has to be more than ten years ago. On our first visit we chose a motel more or less at random. It wasn’t the greatest choice. It’s not that it wasn’t a nice place, by any means. It’s just that the room was decorated with antiques and there was a sign saying, “Please do not sit on our beautiful antique bedspreads.” Say what? The place was run by a husband and wife. The wife ran the front desk, and she was not terribly well-informed. We asked her about the Sea Chest restaurant two doors down. She said that they don’t take reservations and that you “just walk in.” She was right about the reservations part, but as for just walking in, it turns out that there is a long line when they open their doors at 5:30. It’s a place we’ve come to love, though, and much more about the Sea Chest on Wednesday. We also asked the innkeeper about the trolleys that went into town. She said that there was no schedule, that you “just stand there and wait.” In our wanderings we discovered the White Water Inn, where there was a trolley schedule posted on the bulletin board and the innkeeper was well-informed. That is where we have stayed every visit since then. Innkeepers have changed over the years, but they have remained friendly and well-informed. We always stay in a room with a fireplace and Jacuzzi tub. Moonstone Beach is just steps away, across Moonstone Beach Drive. One of the marvelous things about Cambria is that it changes little. The wine shop (more on that tomorrow) I believe has changed owners. The White Water Inn now has DVD players rather than VHS players, the TVs are now flat screen, and they provide wireless Internet access. 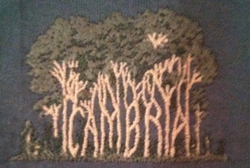 But in general the Cambria we visited all those many years ago is the same Cambria that we visited last week. It’s a marvelous place to relax, get away, and recharge. And to make that primal connection with the ocean and the tides. This reminded me of our visits to the Sea Star Cottage at Tomales Bay. The innkeeper told us of someone asking the ranger, “What time is the whale show?” Answer: “Whenever they want.” She also mentioned explaining to someone about the Sea Star, which we love and which sits over the bay at the end of a 50 foot walkway, and how at high tide it was over water, but at low tide there was no water. Question, “How often does this happen?” Um, twice a day? Ya see, that’s how the tides work. About four decks above sea level, I’d reckon.